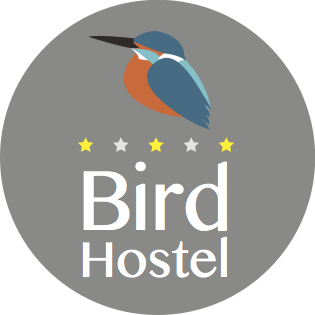 Bird hostel is an amazingly cozy, comfortable, and affordable Hostel, located next to Gosho, "The Imperial Palace," in the heart of Kyoto city. It has easy access to beautiful temples, historical shrines, popular museums, and great shopping nearby. Our stylishly modern Café bar, is the focal point of our hostel. Everyone has a story to tell, it is a great environment to relax, enjoying the traditional taste Japanese style coffee, or enjoying a great drink while telling tales of your home country and adventures traveling around the world with local Japanese and many others in between sightseeing. Most of our staff are local Japanese from the Kyoto area, who have a vast knowledge of Kyoto and the Kansai. If any of our guests need suggestions on an attractive spot or change in plans we can suggest very attractive places that are less known to foreigners where you can really see what it is like to experience Japanese culture. If you are looking for a cozy and attractive place to stay while traveling in Kyoto, the Bird Hostel will live up to your expectations. It is a place where you can enjoy a good night's sleep and be ready for your adventures around the ancient.